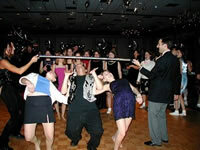 Sound Stage Entertainment party specialists in Cleveland Akron and Canton. Ensure you party's success with Sound Stage. We perform at hundreds of parties each year. Our entertainers have the experience, equipment, and music selection to guarantee a fantastic time! Click here for some recent references! Let Sound Stage bring the Energy to your party. With today's best music, light shows, laser karaoke, and the hottest DJ personalities, we have what it takes to make your event the best ever! Your guests will rave about how much of a great time they had! You can use the checker below to immediately see if we are available on your date.. Along with our professional music and entertainment services, we also have Bounce Houses. Add this to your party and add hours of extra fun to your party!